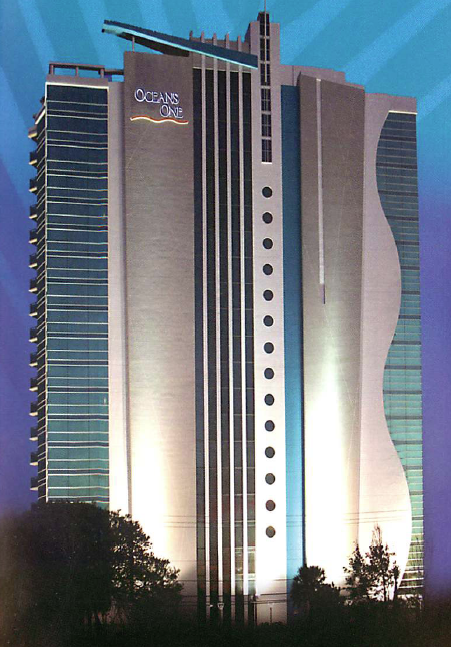 Located directly on the wide, friendly white sand beaches of the Grand Strand’s Myrtle Beach is Oceans One Resort. The ultra modern architecture and beauty of Oceans One is eclipsed only by the contemporary decor of the condominiums and the endless ocean views. Coupled with a host of resort style amenities, Oceans One has recently been voted “BEST OF THE BEACH” for Best Overall Hotel. 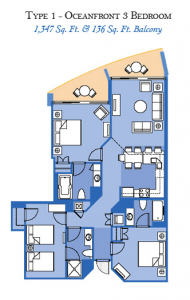 Oceans One is conveniently located at the foot of the world famous Myrtle Beach Boardwalk and only one block from the Family Kingdom Amusement Park and 2nd Avenue Pier. The Myrtle Beach Skywheel, Broadway at the Beach and the countless other attractions that draw 14 million visitors a year are all just a short drive away. If you are looking for a second home or rental property, look no further. Oceans One has 1, 2, & 3 bedroom BANK OWNED OCEANFRONT CONDOS for sale. These fully furnished & accessorized units have proven rental histories and can be settled on immediately. Plan is representative – 4 plans to choose from. 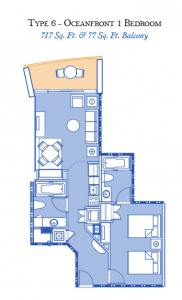 1 Bedroom with one King or two Queen beds, 1 Full Bath, and a living and dining area. 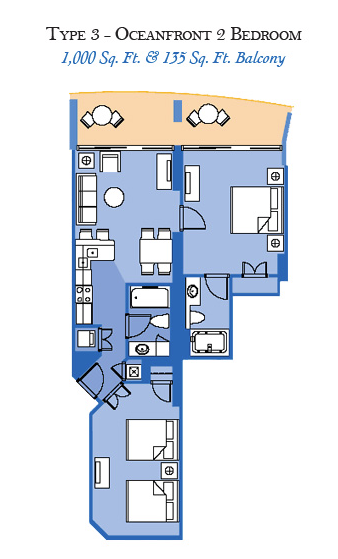 There are accommodations for a maximum of four to six adults. 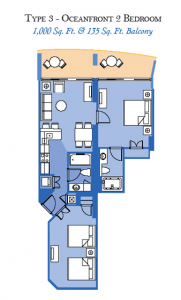 Take advantage of multiple closets, stainless steel appliances, and more modern amenities in this unit. Enjoy the morning sunrise with your breakfast on your oceanfront balcony overlooking the white sands of the Grand Strand. 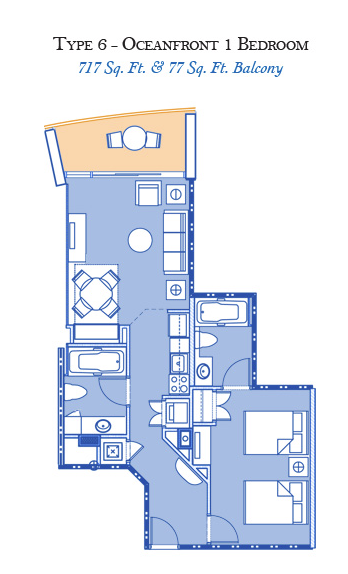 2 Bedrooms with either one King bed each or one with a King and one with two Queen beds. 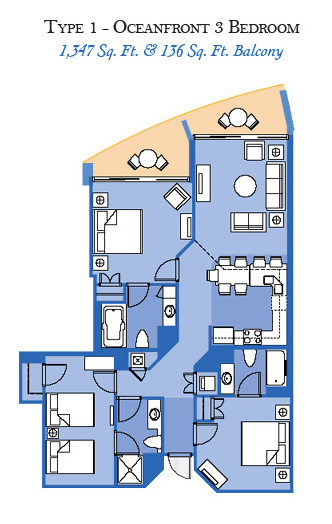 Also, 2 Baths with jacuzzi jets in the master bath, and either 1 or 2 oceanfront balconies, depending on the exact floorplan. Modern amenities complement the ultra-modern styling of these units, featuring full size refrigerator with ice maker, sitting area and hi-speed internet. Surround yourself with luxury in this spacious, oceanfront condo. Representative – Different plans to choose from. 3 Bedrooms and 3 Bathrooms. The master and second bedrooms have king beds, the third bedroom has 2 double beds, plus there is a sofa bed in the living area. The master bath also features luxurious jacuzzi jets in the bathtub. Not only do these units offer multiple closets and the most modern amenities and styling, but they all offer two oceanfront balconies, with one off the living area and one off the master bedroom. Spacious and luxurious.